The Giant’s Causeway is an area of about 40,000 interlocking basalt columns, the result of an ancient volcanic fissure eruption. 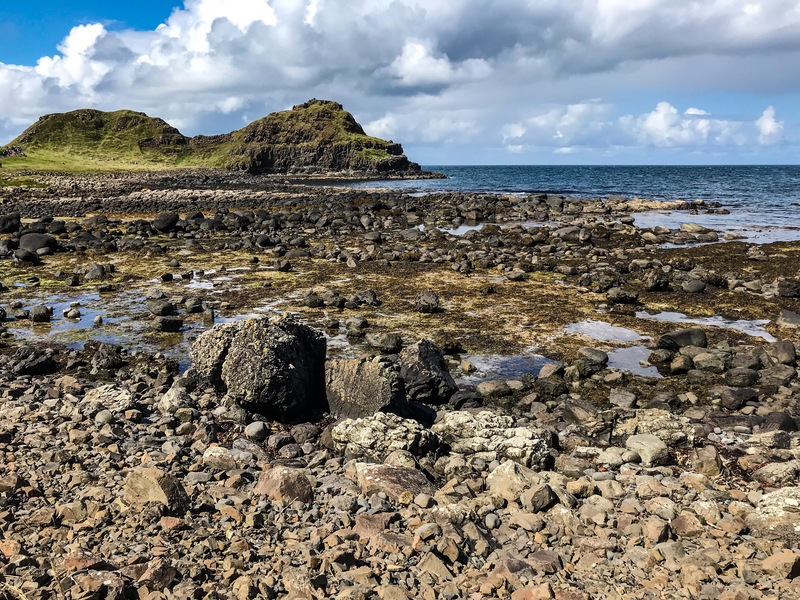 It is located in County Antrim on the north coast of Northern Ireland, about three miles (4.8 km) northeast of the town of Bushmills and roughly a 2-hour drive from Belfast (depending on the route). It was declared a World Heritage Site by UNESCO in 1986, and a national nature reserve in 1987 by the Department of the Environment for Northern Ireland. The tops of the columns form stepping stones that lead from the cliff foot and disappear under the sea. 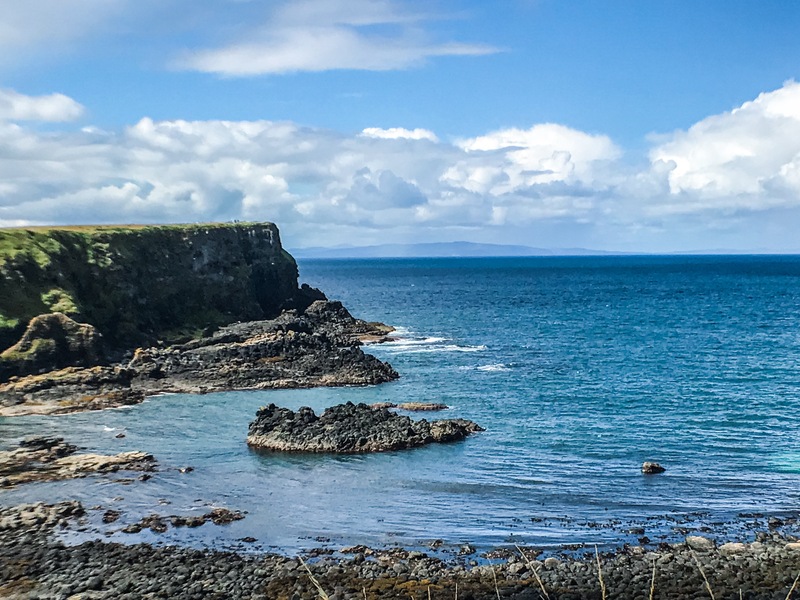 This incredibly scenic part of the jaw-dropping Antrim Coast is a must-visit for anyone traveling to Northern Ireland. 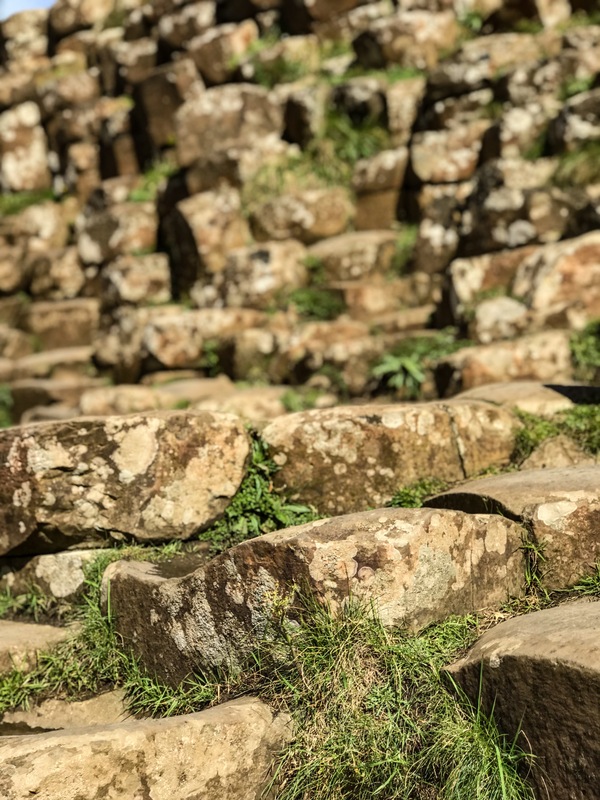 While the Giant’s Causeway is mostly wheelchair accessible (with the exception of the columns themselves), there are some things you should know prior to your arrival to make the most of your visit. 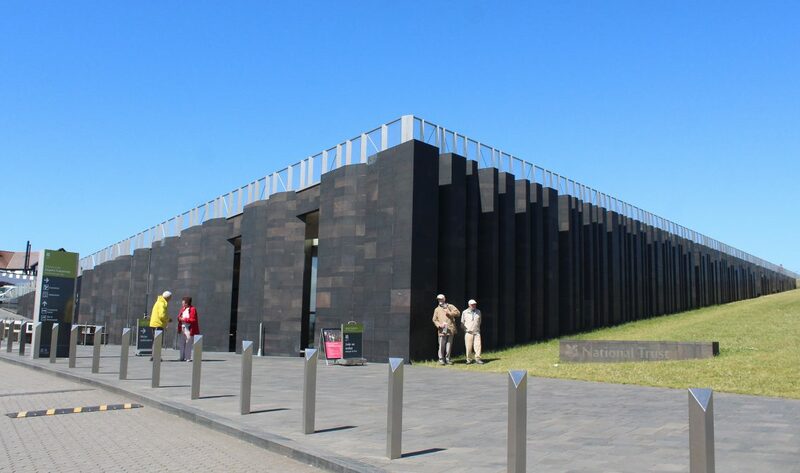 Rising and blending into the landscape, with walls of glass, basalt columns and a state of the art interior, the Giant’s Causeway Visitor Centre is truly innovative. The energy efficient building boasts a number of exhibition areas and a grass roof with 360 degree views of the Causeway coastline. This is where the science and the stories come to life. The entire Visitor Centre is wheelchair accessible, including the toilets and gift shop. You can view this document for all of the Centre’s access information. You can arrive either by city bus, coach tour bus (if you find one with a wheelchair lift), or private accessible taxi (my recommendation). The Centre opening and closing times can be found here, and the Causeway paths themselves are open from dawn to dusk. Adult admission is £11.50 per person; however, if you wish to save some money and bypass the Visitor Centre experience, you can access the path that leads to the stones via the bus access road. Make sure you’re prepared for any weather conditions before you head out of the Centre, as they can change quite suddenly in Northern Ireland, and there is no shelter along the 0.8-mile path. It can be very windy along the Giant’s Causeway, so I would recommend a raincoat or poncho over an umbrella. I would also recommend dressing in layers, as temperatures can drop quickly. You have two options for reaching the famous hexagonal basalt stones on the Giant’s Causeway. The Blue Trail to access the site is just under a mile long, and you can view the map and details here. Option One is to roll there, as it is fully paved. However, you should know that it is very hilly and quite steep in some parts. Manual wheelchair users will struggle without some assistance, and power wheelchair users should arrive with fully charged batteries. If you choose to roll (which is my preferred method, as the views are incredible, make sure you stay on the sidewalk to the left of the paved road. The road is smoother and plenty of people will be walking on it. However, it’s used by the Visitor Centre shuttles, and there’s not enough room on the road for the shuttle to go around you. There are also no curb cuts from the sidewalk to and from the road. I made the mistake of starting on the road and had to be quickly lifted in my scooter onto the sidewalk by kind strangers to get out of the way of the bus. Option Two is to take the wheelchair accessible shuttle bus for £1 each way between the Visitor Centre and the stones at the end of the Blue Trail. The benefit of this is saving you battery or pushing power. The downside is that LOTS of people don’t want to walk the hilly trail either, especially on the (mostly uphill) way back. You could be waiting as long as an hour to board the bus, especially during busier times of the year (typically summer). In general, whether rolling or riding to the stones, you will be surrounded by a LOT of tourists – many of whom won’t be paying attention to where they’re going because they’re taking pictures. Most people will gladly give you right of way, as the sidewalk is very narrow in some spots. But you must always be cognizant of someone running into you, and you’ll have to say “excuse me!” quite often to get past someone blocking your path. When you get back to the Visitors Centre, you can enjoy a selection of local tasty food and refreshments in the Visitor Centre café. Whether you fancy a quick cappuccino and a muffin or a more wholesome bowl of traditional Irish stew or the delicious North Coast Seafood Chowder, the menu is sure to have something to tempt you. They also have free wi-fi for you to use. 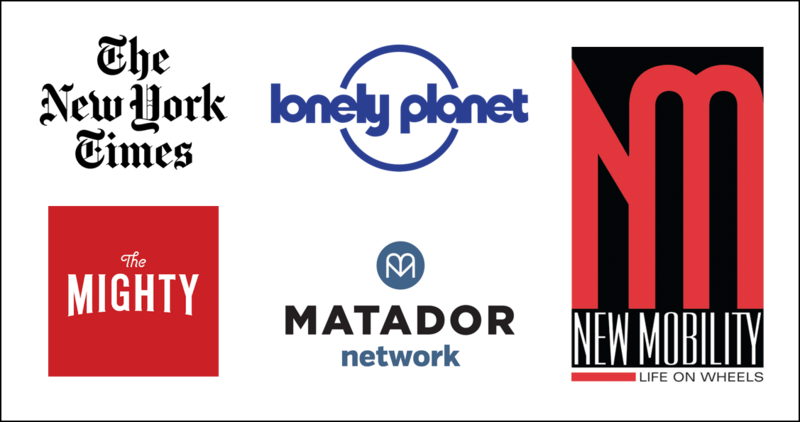 Between 80-90 percent of product lines in the gift shop are locally sourced. From fudge and biscuits to colourful acrylics and sketches, the Centre stocks an extensive range of quality local craft products. This is hugely important as it seeks to spread the benefits of the Giant’s Causeway to the local economy. Are you ready for an amazing accessible adventure in Northern Ireland? 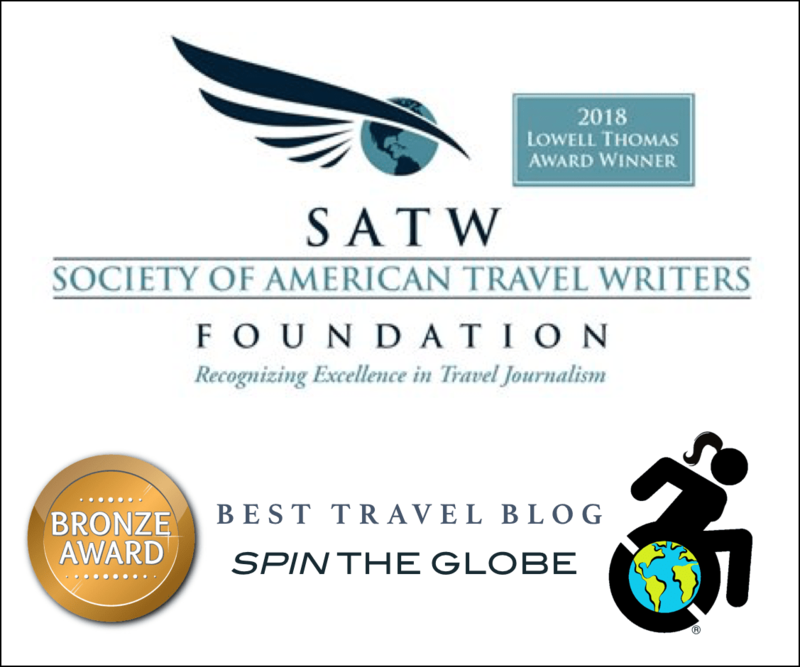 Contact me at Spin the Globe/Travel so I can help you arrange a visit to Belfast!